Bleak forecasts and gloomy skies surrounded the days leading up to the return of the North East Mini Stock Tour along with its sponsors Texas Roadhouse and Twisted Tea to the one third mile flat oval in Hermon, ME. The last race at Speedway 95 for the NEMST was held in May of 2009 the first year of the mini stock touring series which has since become one of the most recognized in New England. That first day saw Justin Trombley take home the feature win, a driver that has had so many laps around the oval he could do it with his eyes closed. Fast forward to 2016. Trombley has decreased the number of tour races he competes in currently and the tour has drawn in the highest caliber of four cylinder competitors the region has to offer. Those competitors include Haywood Herriott and Zach Audet who both won their heat races during Sunday’s event, as well as 2 time champion Emerson Cayer and entering point leader Nick Maniatis. 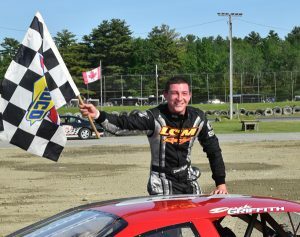 Hermon, Maine – Garrett Hall of Scarborough charged into contention from his sixth row starting position, battling his way to victory lane Sunday in a rain-plagued 150-lap Pro All Stars Series Super Late Model race that went the scheduled distance at Speedway 95 in Hermon. Hall, who said he was told the track “was flat and bumpy” had never seen the track prior to Sunday’s event. After several rain delays interrupted practice sessions and qualifying races, weather continued to threaten, so Hall – starting back in the field as a previous 2016 race winner on the series, wasted little time making his way through the field on the tight track. Through the first three PASS North races of the 2016 season, there have been three different winners. Beech Ridge winner DJ Shaw currently leads the standings by four points over Oxford winner Ben Rowe and is just 13 markers ahead of Thompson winner Garrett Hall. Speedway 95 favorite, Mike Hopkins, who also hails from Hermon, sits fourth in the standings just 23 points behind Shaw. Hopkins has had a fast start to the year with two top 10s to begin the PASS North campaign and a runner-up finish in the PASS National Championship opener at Greenville-Pickens Speedway in South Carolina. Hopkins feels he and his team are primed for their first PASS North Super Late Model victory this Sunday afternoon at Speedway 95. John Curtis Jr. of Hermon won the biggest race of his career to date at Speedway 95 Sunday afternoon when he won the Veteran’s Remembrance 150 for Late Models. Curtis started 6 in the field of 16 that took the green flag, and took the lead from Andrew McLaughlin of Harrington on lap 95. Wayne Parritt Jr. of Steuben also got by McLaughlin late in the going and challenged Curtis for the lead following a lap 142 restart. Curtis was able to keep the lead by sticking to the bottom groove, relegating Parritt to a runner up finish. McLaughlin finished third, followed by Corinna’s Paul White in fourth and Milo’s Nick Jenkins in fifth. Brenton Parritt of Steuben, Josh St. Clair of Liberty, Deane Smart of Bradley, Donny Blanchard of Orrington and Chris Ryan of Newburgh rounded out the top 10. Hermon’s John Curtis Jr. fought off a late race challenge from 2015 division champion Brenton Parritt of Steuben to win the 40 lap Dysart’s Late Model feature at Speedway 95 Saturday night. Curtis led the majority of the laps in the event, but Parritt closed up following a mid-race restart and challenged Curtis over the last half of the race. Parritt finished second with Wayne Parritt Jr. of Steuben finishing third. Deane Smart of Bradley was fourth and Trey Brown of Winterport finished fifth in his first ever Late Model feature race.